After a long winter, and several very hectic months of working Deborah & I departed for our Ecuadorian adventure at the end of April. A late night drive and a few hours of sleep in Vancouver; an early morning flight to Huston, Texas; and then on to Quito, the capital city of Ecuador. For some reason most flights into this Andean mountain city from North America arrive just before midnight. 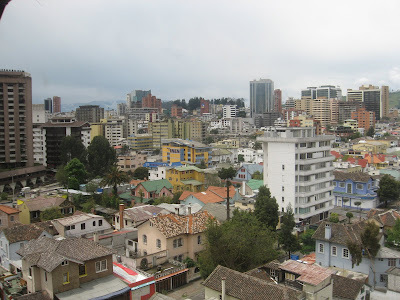 Ecuador is geographically small but the most densely populated country in South America with over 12.5 million people. The richness lies in its cultural and natural diversity. The country lying on the equator spans both the Northern & Southern hemisphere and is home to the world famous Galapagos Islands, and several active volcanoes. The countries coastal areas are separated from the Amazon by the Andes mountain range dividing the length of the country. We were welcomed into a modern, technologically advanced airport terminal with the unique human touch of grand bouquets of beautiful fresh roses, and terminal staff wearing formal suits, and warm smiles. I had made airport transfer arrangements to our hostal in advance (although this doesn’t always mean anything in South American countries) and we were pleased when, exhausted in the wee hours of the morning, we spotted our name being waived on a placard by the driver. Hostal Cartuja, our home for a few days, is a small, but very quaint, former British Embassy in a central area of Quito. Located adjacent to the Old Colonial Town and only a few blocks from an international mecca of coffee shops, restaurants, boutique stores & hotels. 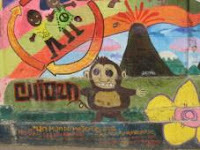 Quito is an intriguing mix of old and new at an elevation of 9,000 + feet with a population of about 2.5 million. It is located in a narrow Andean Valley that extends 80 kilometers in length and is surrounded by volcanoes. 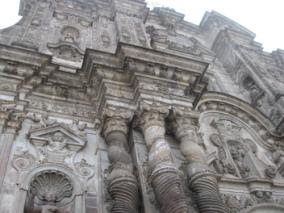 In 1978 Quito was the first city in the world to receive world heritage site status from UNESCO. And without any doubt the reason is very clear. Wrought iron balconies line steep narrow cobblestone streets. The collection of art, museums, plazas, parks, theaters, monasteries, and 90 churches dating back to as early as the 15th century, is beyond words. 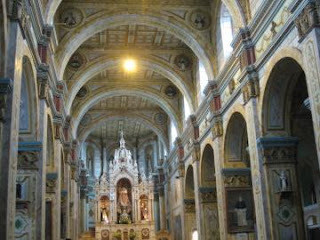 In particular the Iglesia de la Compania de Jesus took the Jesuits over 160 years to build. (exterior shown on the right) Construction started in 1605. It is a Latin American baroque style with literally every inch filled with sculptures and ornate carvings decorated with seven tons of 23 kt gold. A huge pump organ (over 100 ft wide) still functions for mass services. Labyrinths of catacombs lie underneath the church housing gold Incan treasures and the burial grounds for church and country leaders. 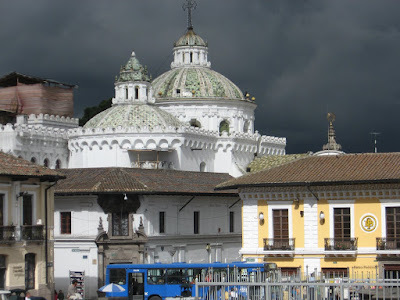 This iglesia is a “ world treasure “ and itself is worth a visit to Quito. You are unable to take photos inside, and the interior photo below is of another church style. In our initial explorations of the capital city we pleasantly found it to be much cleaner, safer, with less military or police personnel than most Latin & South American countries we have visited so far, and the people are very friendly. Although on the equator the altitude significantly moderates the temperature to be spring like all year. With the climate they say you can experience several seasons each day. We watched men working on a cement road and marveled at the lack of power tools. We would be more accustomed to see the repair work they were performing being done by a pneumatic jackhammer. Instead a team of men were on their knees using hammers & chisels in order to make the road repairs. The streets seemed strangely void of people and activity for a large city – we learned this was a holiday weekend and “ most or many “ people head to the beaches for the weekend. We enjoyed a panoramic view of the city atop the 9 stories Chalet Swisse and had a lovely dinner for two including red wine for about $ 10. 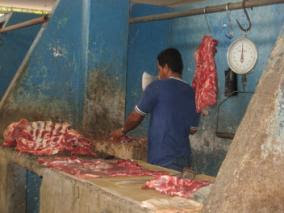 Typical of many countries - the finest products of the country are primarily exported and not readily available locally. 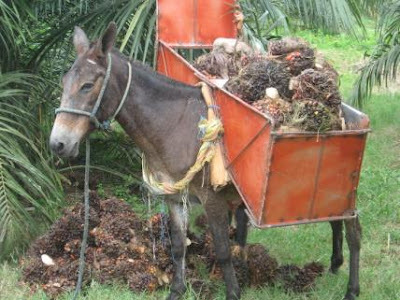 So while we thought we would enjoy the best bananas, coffee, and chocolate much of the production has been exported. 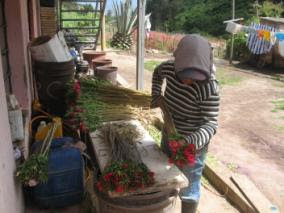 Roses, flowers, shrimp, cocoa, other exotic fruit, and African Palm Oil are also major commodities produced here. Seafood is plentiful, and wonderfully fresh as it is caught in the coastal fishing villages daily. We have enjoyed eating cerviche, trucha, camerone, and a variety of other fish from the sea. We have seen cocao drying, African Palm oil processed, flowers harvested for export, bananas harvested for export, passion fruit farms, rubber tree plantations, shrimp farms and many other fascinating things. Next we fly off to Cuenca a charming colonial city much smaller than Quito, or Guayaquil, the countries two largest metropolitan cities. Cuenca has a population of about 300,000 and on our arrival our taxi from the airport we followed a countryman walking with four goats. Many of the streets in Cuenca are “una via” or one way and not well marked so when driving by vehicle you must know your way around. Fortunately taxis are plentiful and inexpensive throughout Ecuador. The business world (including most shops & offices) in Ecuador close for the mid day meal and have their main meal of the day with their family at home. The “ siesta break “ is generally two hours, but may be scheduled anywhere from noon to three o’clock. This takes some adjusting, as you are unable to count on a place being open. 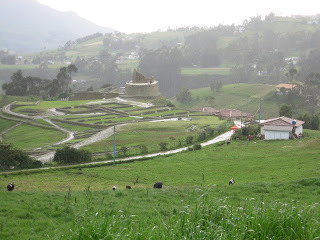 We traveled up the mountains and went to see the largest Inca ruins in Ecuador to survive the Spanish invasion – Ingapirca : Temple of the Sun ( Machu Pichu is nearby in Peru ) The canari first built their temple Cashaloma which was taken over by the Inca’s at the end of the 15th century. They were subsequently flattened by the Spanish. In the centuries since the Inca’s have departed, many of the stones have been removed and carted miles away to Cuenca for building foundations, especially churches. In our travels we have noticed that the indigenous people seem to build their homes immediately adjacent to the road or highway similar to Venezuela. In their front yards, or fields right at the road’s edge you will see pigs, goats, sheep and cows tethered and eating the grass at the road’s edge. Once in awhile an escaped animal will be walking itself down the road. Along the roadsides, small villages often had whole pigs roasting on a stick over an open fire. Returning down the mountain later most of the pig was missing as it had been sold during the course of the business day. Chickens, goat, rabbit, and “ cuy “ guinea pig were also available fresh or roasted. 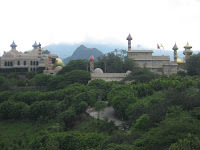 During our travels we went up one very muddy road and at the top discovered a very unique house, this castle like house is owned by a very wealthy man who is purchasing as much property in the Yunguilla valley as he is able, including control over the source of water for rural residents. The grounds of his castle apparently contain not only pools, tennis courts etc but a personal zoo, which has lions and other exotic animals. 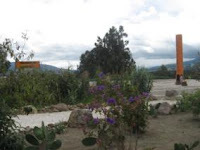 The house and grounds are of Middle Eastern design and certainly not typical of Ecuador. Bus travel in a rattletrap bus puffing its way up the hillside, with knee-slapping music, inspires fond or not-so-fond memories for anyone who has spent time in Latin or South America. The extensive network of bus routes is like a giant spider web linking the poorest, and remotest indigenous communities with the capital and all other cities, inexpensively and efficiently. Quality varies widely with the short routes having the typical rattletraps filled to the brim with chickens, goats, and singing people to the luxurious longer route coaches which are far superior to anything we have seen in North America – they are similar to flying first class with hostesses, air conditioning, wide reclining leather seats, food services, movies, and more. The luxury service is about $ 1 per traveling hour (e.g. Kamloops to Vancouver would be $ 3.50 ) with the economy buses being about $ .25 per hour. The view from the front seats is incredible, so much so, that we saw our first “ dog with nine lives. “ This dog was struck by a car in front, and hurdled into the air. The bus driver braked suddenly, swerved violently to miss the flying twirling body and clipped it with the corner of the bus. We witnessed it land, spring to its feet, shake, and run off into the fields. At other points the road had washed away, leaving a single lane, looking over a steep abrupt edge, within inches of the front tires, down the mountain you could not see the bottom!! A unique economy has been created – at each community there is a speed bump to control the speed of vehicular traffic. At these points local vendors would board the bus to sell cold drinks, local food, fruit, snacks, or handicrafts. Depending on their sales success they then return to the front of the bus requesting the driver to stop and let them off. 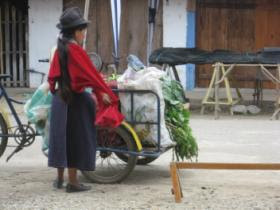 The vendor then walks back to their village: the more sales the longer the walk! I had a smile when in Puerto Lopez the bus backed into a narrow alleyway to enable passengers to disembark and new ones to load – street vendors lined the edges to sell their wares. An elderly lady reached out of her window seat and called for some meat off a bar-b-que. The young man delivered her some of his wares in a napkin for which she accepted and handed him payment through the window. Moments later she shrieked, scolded him, and spat and threw several pieces of charcoal to the ground. He had the biggest boyish impish grin on his face and promptly and apologetically delivered her some finer choice meat. I don’t know whether he was hoping the bus would pull away faster - we felt better knowing that it isn’t just unsuspecting gringo travellers that are sometimes taken advantage off. When leaving Cuenca we were stopped by the national police checking for papers, and weapons on all vehicles heading to the coastal areas which are more volatile. The entire bus was emptied of nationals excepting a Nun and ourselves, and they were all frisked and had their identification reviewed. The empty bus was searched. In traveling we have come across many landslides where the roads have been destroyed by an extraordinary amount of rain that the area has experienced since January. The roads are punished with rainfall and high volumes of heavy commercial traffic resulting in washouts, potholes and upheavals similar to what our roads experience due to our extreme temperatures and cold winters. We are again discovering and enjoying many new tropical exotic fruits and vegetables, and as most can be grown year round they are readily available. Fresh juice is very common on the daily menu. Batidos (milkshakes) and helado (ice cream) are made with fresh exotic fruits providing a flavour, which is out of this world. Chocolate covered banana’s cost $ .15. A vegetable called tree tomatoe makes a wonderful tasty and healthy juice. They are several varieties, which are beetroot, or orange in color, oblong in shape, firm, with a waxy skin. Quinoa is an ancient grain with excellent nutrients. Tavo you would be very pleased to know that here Uyuccas (a savoury corn bread mixture wrapped in a banana leaf) are readily available on weekends throughout the year although the texture is more custard like and they were sweeter. Most restaurants here offer a “menu el dia” or preset daily menu, which starts with soup, main course of meat, rice, beans, vegetables, and a drink. To date our experience has the cost per person ranging from $ .80 to $ 2.50. 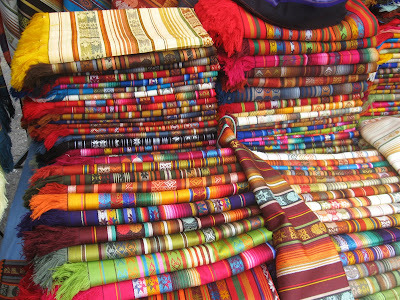 Fresh fruit, vegetable, meat, and fish markets are everywhere, and we visited the world famous indigenous artisan market in Otavalo. Sunday most stores are closed, and watching the street you see families heading to church dressed in their best Sunday clothes and the Indigenous people in their traditional colourful dress. This is a very warm loving society, where people still hold hands, value family traditions, and openly express affection. Children are laughing and playing in the streets late into the evening. Perhaps subconsciously part of Deb & my deep respect and affection for these people has to do with their shorter stature! Conversely they will not hesitate to join together and take control over a situation with vigilante action where they have been wronged: lynching a thief, or corrupt politician! Large banana plantations individually cover the banana bunches for export with plastic to protect them from insects, discolouration, and provide a constant temperature for maturing. 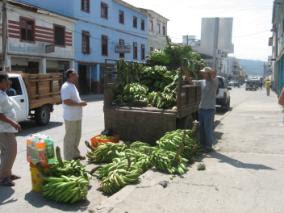 The bananas, which are exported leave the tree unripened and green, and spend several weeks in trucks, and boats on their voyage to North American shelves. The central bus depot in Guayaquil is very new and large being built in coordination with a very large retail shopping mall. From Guayaquil a major inland seaport with a wonderful new malecon we headed for the coast. Salinas is one of the country’s best resorts and is a sprawling “ Miami like “ development that holds down the westernmost tip of the peninsula coast. 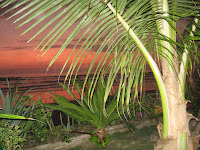 Further up the coast Montanita is a small fishing village, with unpaved streets, that owes it increasing popularity to young and old surfers, and a colourful beach lifestyle. It is a wonderfully vibrant & colourful city where you can “ people watch “ for endless hours. The small Hosteria we stayed in was right on the ocean side beach. At night you would be lulled to sleep with the regular rhythm of the waves crashing on the beach. Dogs & roosters are the other prevailing night sounds. Our next bus was from Montanita to Puerto Lopez. Puerto Lopez is known as the “Acapulco of Ecuador” which has a wide bay, which is filled with fishing boats and is surrounded by green hills. Further up the coast is Bahia de Caraquez. Our hosteria here is Coco Bongo operated by Susie a wonderful Australian lady. 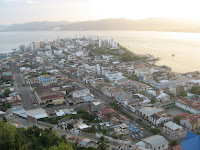 The city is on a peninsula of land, which has the Pacific Ocean on one side and the Rio Chone on the other. They have an extensive malecon (seawall walk) similar to Vancouver and the harbour supports a variety of commercial vessels, private yachts, and leisure craft activity. The city suffered three significant natural disasters in 1998 a major earthquake leveled a large portion of the city and left its residents without electricity and water for many months, El Nino rains caused extensive flooding and erosion of the hillsides, and an epidemic disease which wiped out their shrimp farms. To this day they are still recovering from those natural disasters. Most of the damage has been repaired but some buildings remain vacant and some damage remains visible, or repairs are still being undertaken. Consequently the city has major infrastructure, and green space parkland which seems to be more than the population warrants.. Bahia declared itself an “eco-city” in 1999, initiating ambitious plans to recycle the city’s waste and bring it into harmony with the surrounding bioregion. It processes and recycles its community grey water it has a thriving inner city taxi system of human powered tricycles. For almost a decade this small community has undertaken a much more extensive recycling program than the program which Kamloops has just now initiated. 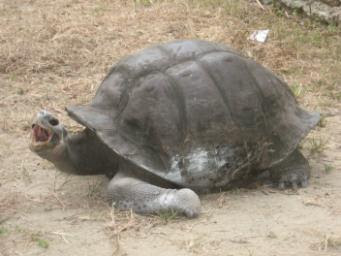 A local school is home to a tortoise from the Galapagos Islands. Apparently Miguleta appeared on the beach many years ago and ended up at the school playground. He was returned to the Galapagos but didn’t eat and got sick. They brought him back and he has lived happily as the school’s mascot ever since. We took a ferry ($.30 per person) across the river to San Vicente and Canoa. Canoa is a quiet but growing fishing town. It draws young travelers to surf sun on the beaches, and enjoy the social nightlife. Primitive beach shacks open during busy weekends to play music, serve food & beverages, and other wares. These informal stands hook themselves to the power lines and take business away from the formal permanent businesses located immediately behind them. We have now spotted several wild, large, fluorescent green iguanas – they can move very quickly. Incan equatorial sundial built with stones and a line representing the equator where one can straddle the Northern and Southern Hemispheres. Our adventure has included hikes into natural areas, strolling through art exhibitions, theaters, and churches, runs along long sandy beaches, striding through cosmopolitan marketplaces, strolls along the malecons, and marching through flower, rose, banana, and African Palm plantations. One of the highlights of our stay in Ecuador, and without a doubt the finest place we stayed, was at Casa Izabella an exquisite bed & breakfast near Quito. The food was magnificent, the bed was like sleeping in a cloud, and this was coupled with the warmth & hospitality of Martha Perez. Martha represented Ecuador in her countries embassy in Washington D.C. for many years, and in retiring, returned to her homeland with her husband to build their custom home and garden. She has an extensive knowledge of the very best her country has to offer and of many hidden gems and treasures that it would take one years of exploration to discover.